There are few places in the U.S. where transit ridership is as low as Indianapolis. Regionally, less than one percent of commuters — about 9,000 people — travel by bus each day, according to the U.S. Census. The vast majority of people drive to work alone, despite the fact that car ownership must be a financial burden for many — more than 20 percent of the city’s population lives in poverty. Next up in the Getting Transit Right series, I’ll be delving into what’s wrong with transit service in Indianapolis and identifying key reasons why few people get on the bus, before looking at how the new funding can build ridership. 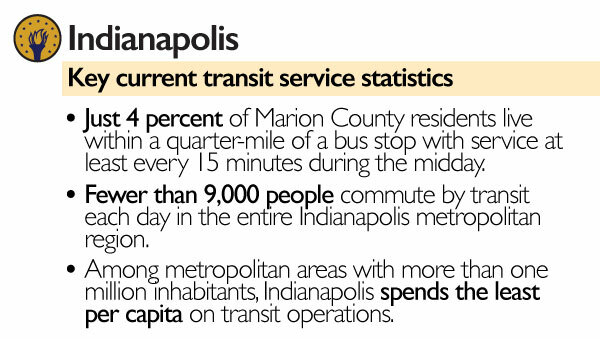 Indianapolis’ transit system, IndyGo, carries about 33,000 riders a day within Marion County, which since 1970 has been a merged government (sometimes referred to as Unigov) with the city of Indianapolis. IndyGo is a Unigov agency funded primarily through local property taxes, federal and state support, and fares. Currently, it provides one type of service: local buses. The IndyGo network is largely a hub-and-spoke model, with lines extending from downtown — sometimes referred to as the Mile Square — in all directions. That makes some sense, given that downtown has a heavy concentration of jobs, including the seat of state government, a Purdue University campus, and several major corporations. There’s also a convention center and an NFL stadium. There are two primary reasons why IndyGo’s network doesn’t offer great accessibility. One, the buses stop frequently, which slows them down. The 39 bus, for example, is scheduled to take 68 minutes to travel its 13-mile route at rush hour — just 11.5 mph. 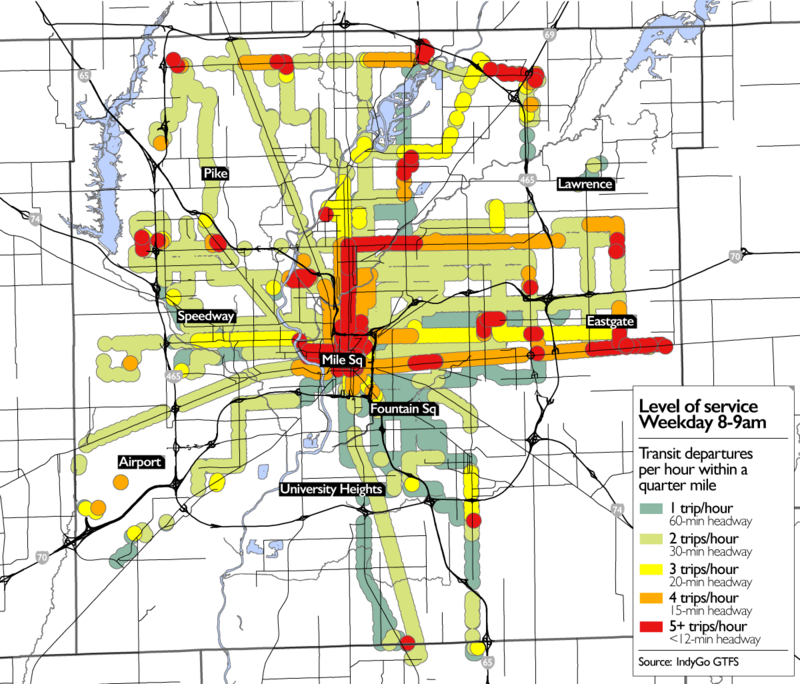 The following two maps illustrate the availability of frequent bus service in Indianapolis. Even at the morning peak — from 8 to 9 a.m. on weekdays — most of the city, if it gets bus service at all, sees buses no more than every half hour. Only the orange and red areas have access to buses that come at least every 15 minutes during the morning rush. Midday bus service doesn’t come more often than once an hour on many routes. Indeed, of the county’s more than 900,000 residents, just 10.6 percent live within a quarter-mile of a bus stop with service at least every 15 minutes during rush hour. Only 4 percent, or 37,000 people, live within a quarter-mile of a bus stop with 15-minute service between 12 p.m. and 1 p.m. on weekdays. In other words, it’s hard to use the bus because you can’t count on a bus showing up when you need it. At the same time, driving is cheap and easy. “We don’t have a lot of traffic,” said Mark Fisher, a vice president of the Indy Chamber, the local chamber of commerce. Indeed, with a jumble of freeways headed every-which-way from downtown and even a full-scale loop expressway circling the city, there is little reason for people not to drive. The data bear this out. Almost 72 percent of Indianapolis commuters have travel times to work of less than 30 minutes, according to the U.S. Census. The vast majority of people own cars. The fundamental reason why Indianapolis doesn’t provide the bus service a city of its size should have is that it doesn’t pay for bus service. In fact, the National Transit Database shows that of the 42 regions in the country with more than a million people, Indianapolis comes in dead last in per-capita transit operations funding at just $43 per person in 2015, or about 12 cents per resident per day. “It’s a chronically underfunded, under-resourced system,” Irwin told me. Mike Terry, president of IndyGo, openly stated that “we’ve been struggling for decades.” The situation has been especially bad since 2004, when the agency cut 20 percent of its routes and increased its fares. With virtually no one riding it and poor service for those who do, Indianapolis needs a lot of work to improve the conditions of its bus system. Little congestion means buses don’t get stuck in traffic much. Very few city residents have access to reliable, frequent, all-day transit. Local bus services haven’t been adapted to modern standards and stop too frequently. Job accessibility by transit is low outside of the central area. Overbuilt freeway network puts transit at a disadvantage. Operations funding has been persistently low. 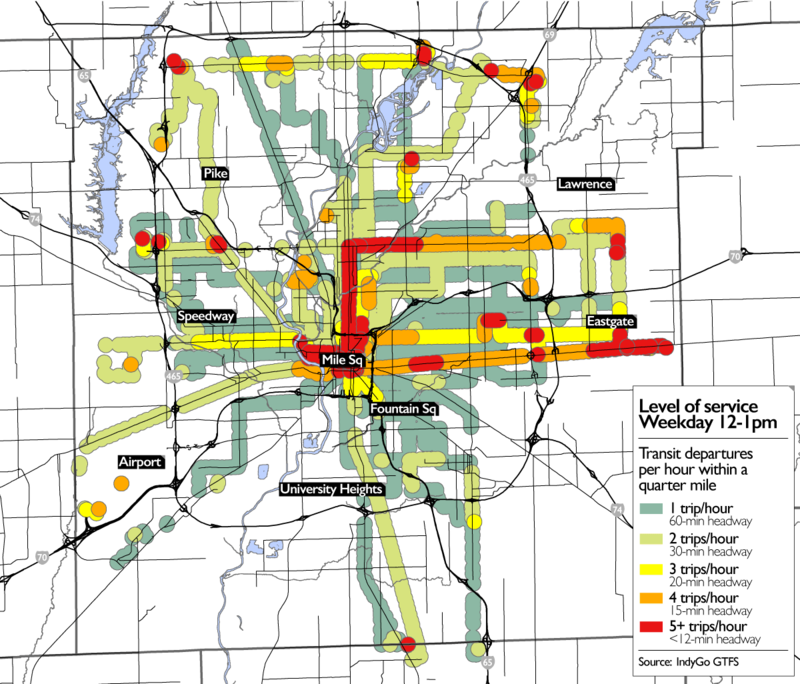 Next week, I’ll explore land use in Indianapolis and how it affects transit ridership. IndyGo’s transit service district is huge, extending from downtown into farmland. Compromising between these areas makes providing effective service difficult. As an Indy resident and business owner, I support better public transit for Indy with my vote and voice. For most people, though, our current system is not usable for daily commutes to and from work. For me, it takes 60-70 min each way to ride the bus from home to work including a transfer through downtown. The drive is 25 min. This is not practical for daily use; this means 1 to 1.5 hrs less time with my family everyday. The new Marion Co Transit Plan is a good start and will significantly increase frequencies and coverage. Indy is gradually building density in its central core. We are headed in the right direction and public support for transit continues to build. This will take time; we are starting from a minimalist system. The ability to own and drive a car in Indianapolis is made downright cheap due to other public policies beyond those that govern IndyGo transit service. Because the state in general and Indianapolis in particular do not require annual vehicle emissions or safety inspections, you can buy a clunker for several hundred dollars and have the freedom to move about at will. It is not uncommon to see such vehicles – lacking side mirrors, bumpers, a headlight, et al – throughout the city, sometimes held together with duct tape or bungee cords or a combination of the two. It is also likely the owners of these vehicles buy just one’s month’s of insurance in order to get a registration license plate, thereafter avoiding the cost of that commodity as well. In Indiana, many policymakers view regulations, even those that could help ensure cars and trucks meet reasonable pollution and safety standards, represent unnecessary government interference in individual freedom. Unless and until Indiana and specifically Indianapolis require more of car and truck owners, few in the city will see transit as vital and necessary. Indianapolis does not have the authority to regulate vehicle emissions, etc. Vehicular regulatory power rests at the state level, so that is an issue to take up with the General Assembly. And, as you indicate regulations are always a hard sell with the General Assembly. ‘That said, while I have seen a few “clunkers” on the streets of Indianapolis, your description which makes it seem like some not as nice version of the streets of Havana is quite an exaggeration. The ability to own a “clunker’ is not why Indianapolis lacks a good public transit system. Indianapolis (with a very robust electric streetcar network) and Indiana (with the vast electric inter-urban railways) at one time had one of the better public transit systems in the nation, but with the post-WWII suburban sprawl explosion and a strong increase in private car ownership, the public transit system became neglected and eventually much of it was dismantled (the inter-urban was completely dismantled and streetcars were first replaced with trolley-buses, then regular buses, and eventually with the merger of the city and county, the bus system was allowed to deteriorate into its current diminished state). The reasons Indianapolis does not have a contemporary robust transit system are because there are more highways than pretty much any other city in the U.S., congestion is very low so it is still relatively easy to commute long distances, and the city and metro area are sprawling with extremely low density that makes it difficult to operate an effective public transit system. The metro area is very affordable compared to most metro areas for the majority of the population to buy a nice home out in the suburbs where there is no public transit and where it is hard to get a public transit to service those areas. Finally, Hoosiers have a high dislike for paying taxes, so increasing funding for public services, such as public transit is always a hard sell. However, the residents of Indianapolis did recently approve the new transit tax to expand the bus system and build a bus rapid transit network, so attitudes are shifting. Bike is not an option for commuting for everybody. I cannot show up at work covered in sweat. Bike commuting is only realistic for those who have the luxury of time and the luxury of a shower at work. Furthermore, biking along West 10th Street is a death wish. Then don’t show up covered in sweat. But it’s usually much quicker to cut across hub-and-spoke systems on a bike than it is to go all the way to the downtown station for a transfer. As for the actual biking itself, take a CyclingSavvy course and make sure you have lights at night. Density, or lack there of, is big challenge for Indy which is unique as pointed out from Unigov set up. Indy is really a small city (core of Center Township) that took in a lot of even rural area and under developed areas that lacked much identity or had core business districts (with few exceptions). Indirectly related, just read booming greater Lafayette area, including West Lafayette which is most densely populated city in state (even sans Purdue students) has second busiest transit (bus system) in state. Students can ride free….the population growth in that area is amazing over the last few decades….until parking becomes too expensive or a hassle, few will give up their car keys…. This is true of many cities that somehow manage to support transit and other alternatives. In Indy, it’s mostly ignorance and a lack of political will. Rail transit is far more attractive to a much wider swath of commuters. Busses are unattractive, get stuck in traffic, and unlike proximity to rail transit, living near a bus does not improve property values. Indy needs a link to the airport and commuter trains east to Muncie and west to Terre Haute via the airport.